EVGA has been busy bolstering its PSU line-up this year. Take the 80 PLUS Gold stable as an example. 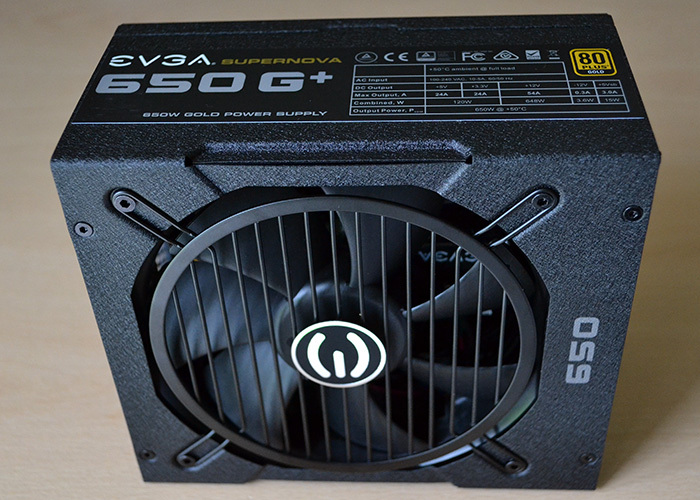 Right now, at a sensible 650W, you have a choice of the GQ, G1, G2, G3 and, now, G1+ models. Gets kind of confusing, doesn't it, as there are differences in terms of absolute form factor, warranty, eco mode, fan size, modularity, and 12V rail arbitration. About the only thing the supplies agree upon is that Gold-level certification. The newest of the bunch is the G1+, launched as a meaningful upgrade over the five-year-old G1 that has, as far as we can discern, sold in spades. It never hurts to improve on a long-standing design, so let's get to the new, revised 650W model. Also available in 750W, 850W and 1,000W capacities, G1+ (though it is referred to as simply G+) it is reasonably different to its namesake predecessor. 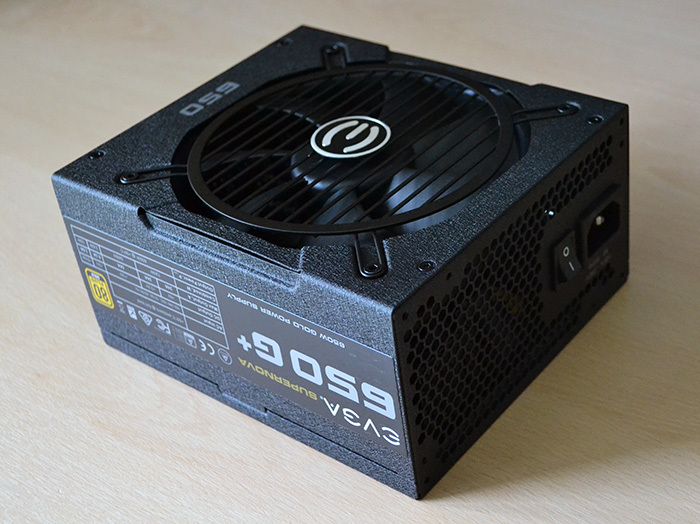 The 650W unit is 170mm deep, or 10mm shorter, while sharing the same 150mm width and 86mm height. It's still not as small as the 150mm-deep G3, but being a tad smaller does help when wiggling cabling inside a small-ish chassis. EVGA also upgrades the fan from the basic G1, this time opting for a 135mm fluid dynamic bearing model rather than a same-sized dual ball bearing. Part of the reason for this move is to reduce noise at full load, with EVGA claiming that G1+ is up to 6dB quieter at full chat. The fan looks a little strange in the chassis because there's a sizeable gap between the chassis and fan edge - it feels as if the spinner was an afterthought. One feature missing is the Eco (hybrid fan) mode present on the G3, whereby the fan only switches on once load hits a reasonable percentage of capacity. EVGA will likely counter with the fact that the 135mm FDB fan remains quiet at all times - and it does, as you will see in the testing - but we'd still like the feature here. A newer internal platform has been heavily tweaked to minimise 12V variation under solid load. The unit has a variable-resistor module for this very purpose, resulting in just 0.52 per cent variation instead of up to 3.76 per cent on G1. That's a handy improvement that we can test for later. 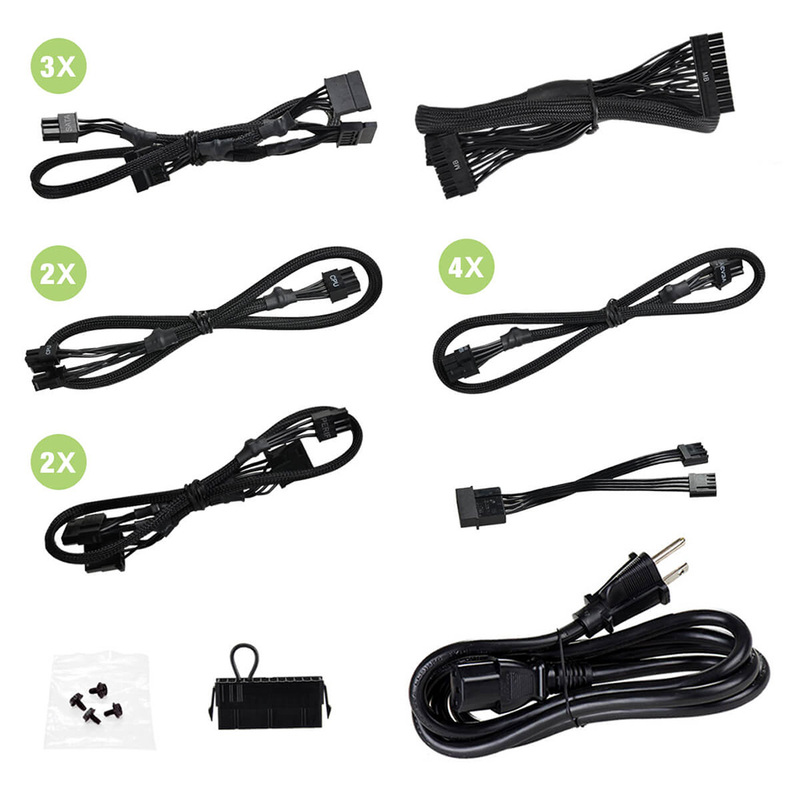 Cabling has also been revised, and we see the supply ship with two 4+4-pin EPS cables (650mm) which are necessary for certain high-end motherboards, including AMD Threadripper. Four 8+2-pin PCIe (650mm) enable a couple of premium cards to be driven along and peripherals are taken care of by nine SATA (550mm-750mm), six Molex (550mm-750mm) and two Floppy extenders. All cables are fully sheathed but are not flat. G1+ uses a single-rail topology where all of the wattage can be run down that line. It's good to see that its full-power rating is at an ambient 50°C, intimating good engineering, and inside EVGA uses a full complement of Japanese capacitors. This feels like a downrated Platinum supply in many regards. The left-hand side takes care of the motherboard and PCIe connectors and the right is home to storage. As the SATA and Molex are powered off three and two cable-runs, respectively, you can plumb the whole lot in, but who these days uses that many drives? We like the fact that there's ample room between the ports for easy engaging and disengaging within a chassis. 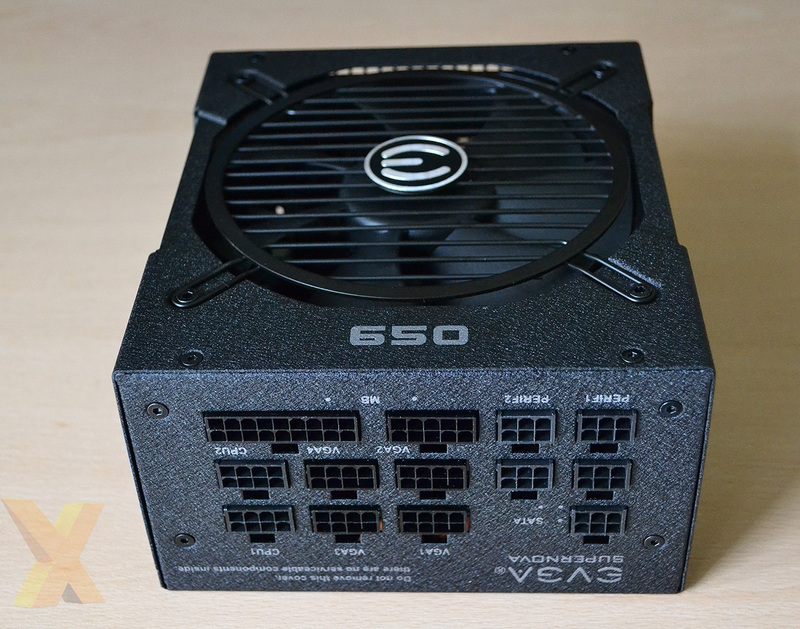 Superflower has been the go-to provider as the OEM platform for recent G-series EVGA PSUs, and though we don't know for sure, the internal handiwork suggest that the G1+ is also using a variant of the Leadex platform. EVGA covers the supply with a 10-year warranty. Pricing is about the same as G3, so roughly £99 for the 650W model, which feels steep compared to quality 650W from, say, Seasonic.